Every game should have a set! Set of 4 die-cut soft cloth pads that mount on the back side of each leg on your game, and protect the cabinet surface from scratches, dents, and "rub" marks from vibrations during normal, and heavy use. 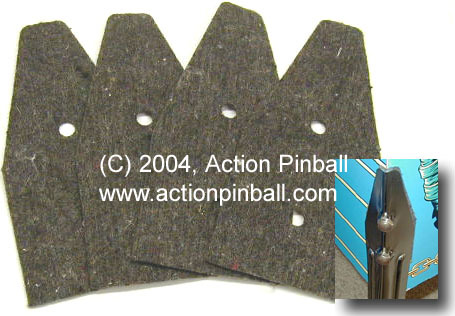 A MUST for brand new games, and A MUST for preserving your prized vintage pinball. No game should be without them! These are not thin felt pads like other dealers sell! Leg pads we sell are made from thick heavy-duty automotive-grade material that look better, hold up longer, and do a better job than cheap imitations! Also far superior to alternative "plastic" protectors- these cloth pads "hide" better behind the legs, aren't abrasive to the finish, and won't leave marks on your cabinet like the plastic protectors will.